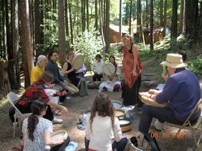 We offer small-group instruction on the following traditional instruments: saz and oud (lutes), riqq (tambourine), darbuka (hand drum), kanun (zither), nay (flute), violin, and clarinet, with Turkish, Armenian, and Arabic styles taught. We will offer daily classes for those who wish to participate in ensembles. In addition, we will have on-going sessions in maqam (modal theory) for those experienced players who wish to learn improvisatory techniques. Traditional dances of Turkiye, Armenia, Lebanon, Egypt and Iran are taught with each of our six dance instructors teaching twice a day. In the evening, dance parties with live music exclusively continue long into the night. If you're used to recordings, you don't know what an experience this can be.